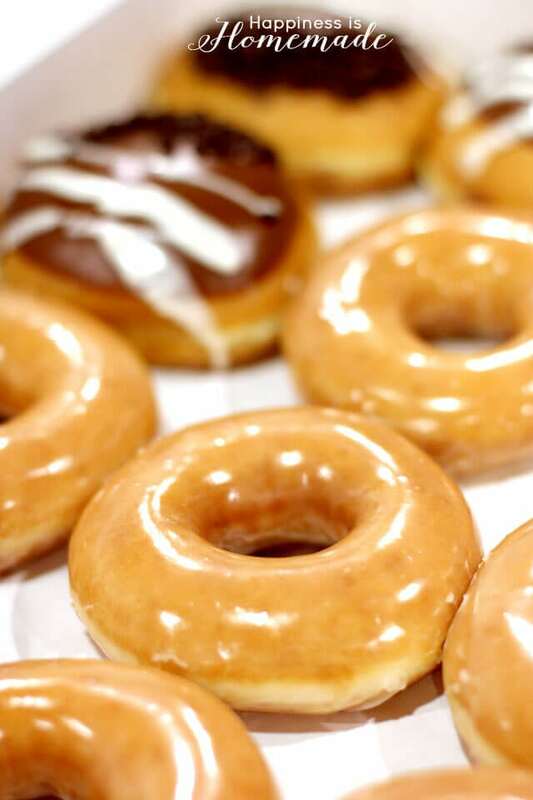 I love donuts. Every time someone has asked me what my favorite food is, for as long as I can remember, the answer has always been donuts. I should probably say something healthy like quinoa tabbouleh, but let’s keep it real…it’s donuts. Last week we wanted to celebrate Sawyer’s last day of tutoring by bringing his learning center teachers a special treat – naturally my first idea was to bring donuts! We wanted to thank his teachers for their incredible work over the past six months (they helped Sawyer jump up over two full grade levels in his reading skills! 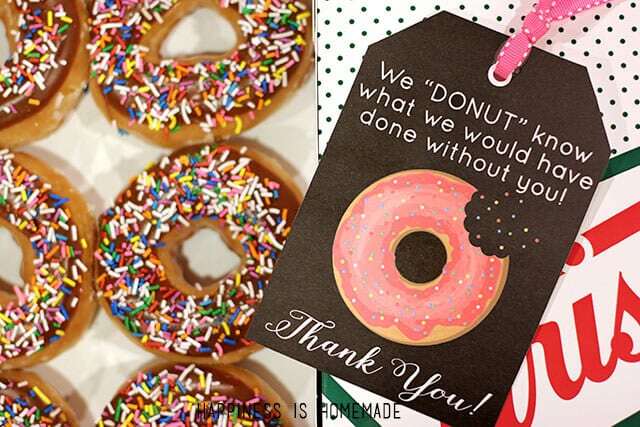 ), so I created these adorable donut thank you gift tags to go along with the sweet treat. The teachers absolutely loved them, and Sawyer was elated that they showered him in hugs and attention as they talked about how much fun this idea was. 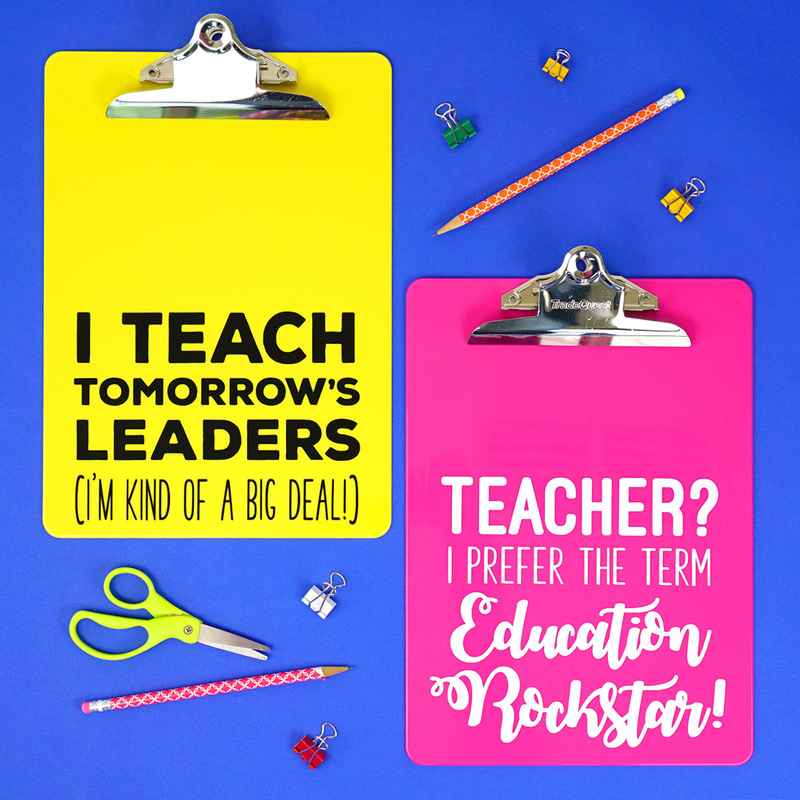 Truthfully, this is one of the easiest and inexpensive teacher gift ideas that we’ve done so far! Oh, and if you don’t want to give your teacher REAL sweets, our Easy DIY Donut Soap is also a fantastic sugar-free alternative gift idea! 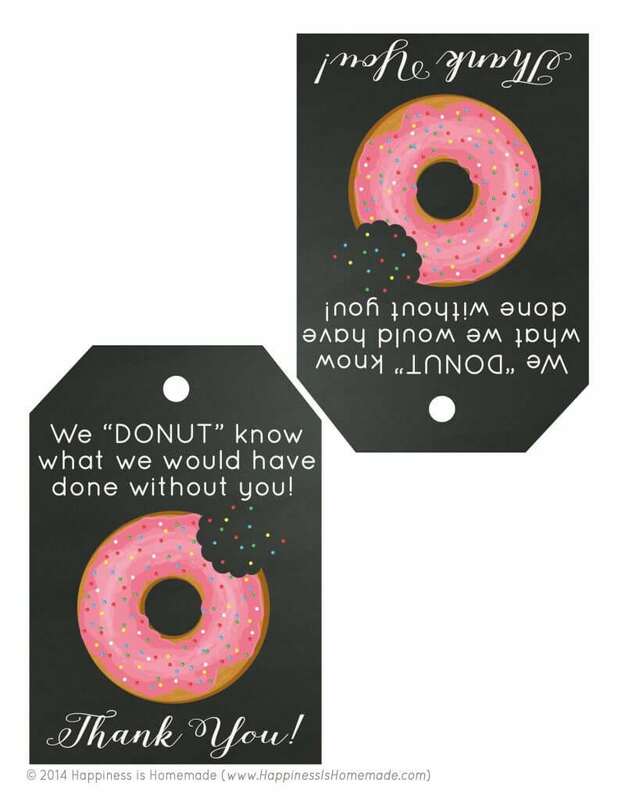 TO PRINT or DOWNLOAD THE DONUT GIFT TAGS, CLICK HERE! Those are sooooo cute! Aren’t you just so clever? Love them and so proud of Sawyer. These are so cute!! And perfect for all kinds of occasions. These are absolutely adorable. Pinned! These are so incredibly cute. Can’t wait to use them! These are adorable. I know a family moving they would love this for their help on moving day. Pinned for later. Stop by anytime. I LOVE that printable! 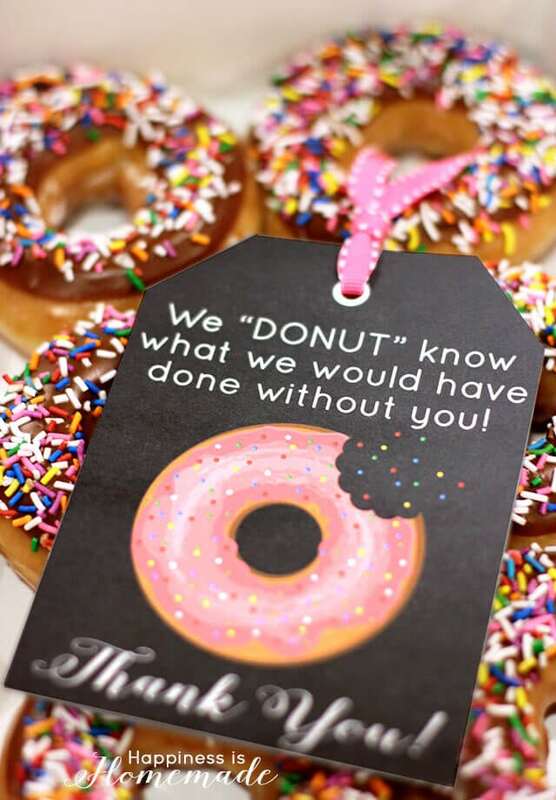 What great idea, and being a former classroom teacher, I know they loved the doughnuts! These thank you tags are sweet. Great way to say thank you. Thanks for sharing. Love this idea! Thanks so much for sharing this at the This Is How We Roll Link Party! Can’t wait to see what you bring next week! These are adorable! LOVE donuts! Pinning for next time I need to send a thank you! Just made these for my student housing property breakfast and we are so happy with how they came out. Thank you so much for sharing this with everyone! I’d like be able to make this for our teachers door. 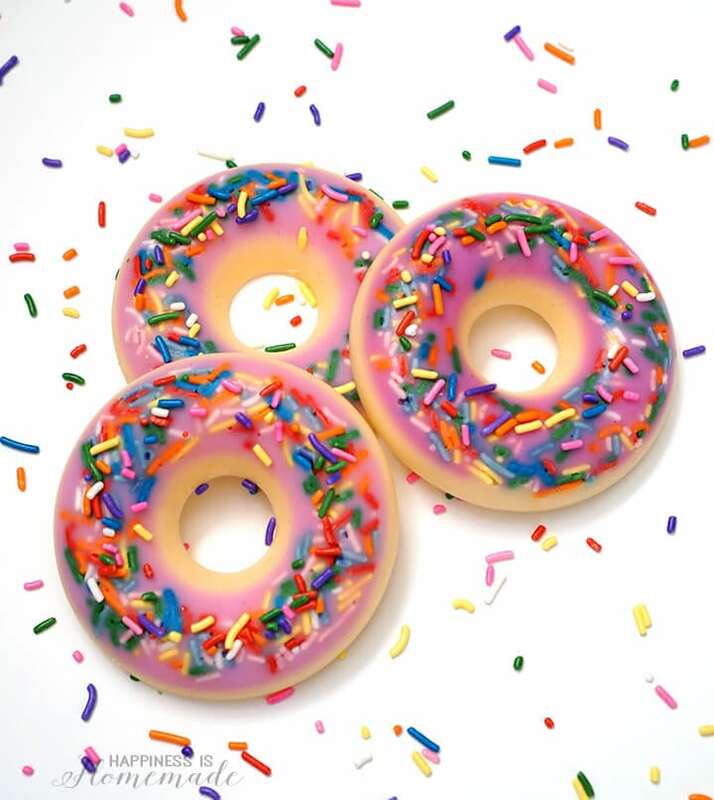 Any chance I could get the JPG of the donut so I can make your handout as large as a classroom door? The donut image is actually part of a clip art package that I purchased, so I am unable to share the file per their terms and conditions. Sorry!